During the next few weeks leading up to the beginning of the cross-country season, MileSplit RI will feature some of our top returning runners this fall. We graduated some outstanding harriers from last year, but we still have an impressive list of talent coming back this season with hopes of making their marks on the dirt trails. After dealing with health-related issues throughout her sophomore season, Doyle came on strong her junior year in 2017-18 and by the outdoor track season was one of our top distance runners. At last year's cross-country state meet, the Ram standout clocked a PR of 19:42.33 to finish 20th overall. We're predicting she'll improve on that time substantially this season. The proof is in what she accomplished once she hit the oval after X-C. During the winter season, she dipped under five minutes for the first time in the 1,500m run, clocking a third-place time of 4:59.47 at the Class A Meet. She also ran 10:43 for 3K at the Yale Track Classic. 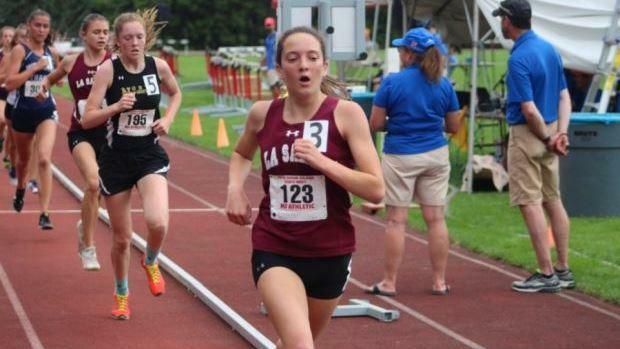 The La Salle standout followed with a stellar outdoor season where she ran an all-time best of 4:50 for 1,500 and captured the 3K title at the Class A meet. At the State Meet, Doyle finished second to multiple all-stater Randi Burr of Westerly in the 3K after doing most of the front-running duties. Her final time of 10:25.07 was a best by nine seconds! Last year's state runner-up Nikki Merrill of Portsmouth is the runner to beat this year for individual glory at the State Meet in early November. But you have to figure with her steady progression from last year, Doyle is on track to make things happen up front with a top finish.